How about both! 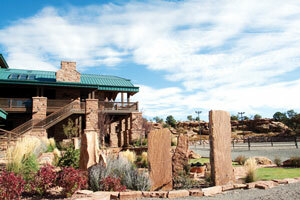 Utah has several luxury lodges and resorts that offer all the amenities of any world-class property anywhere. And many of those amenities are high adventure outdoor recreation. The Hyatt Escala Lodge, a AAA Four Diamond resort, is an all-season luxury property located within the mountainside village of the Canyons Resort at Park City, just 30 minutes from the Salt Lake City International Airport. Utah boasts "The Greatest Snow on Earth!" But does Park City mothball when all that snow melts and summer returns? Not a chance! There's so much activity going on during summer even the Chamber of Commerce scrambles to keep track. Events, festivals, concerts, recreation, you name it, Park City summer has it. Golf, flyfishing, horseback riding, hiking, mountain biking, hot air balloons, rides for kids and on and on! In summer, Canyons Resort offers scenic gondola rides, miles of hiking and mountain bike trails, and outdoor concerts. Capture panoramic views of the majestic Wasatch Mountains as the Red Pine Gondola whisks to an alpine summer adventure at 8000 feet. The summer program features an all-new bike park located at mid-mountain, serviced by the High Meadow lift. The park facility includes a skills park and three different skill-level trails with a variety of features. Do you pine to wet a line? Go no further, because the resort's reservoir is amply stocked with 10" to 18" Tiger Trout, one of Utah's famed fighting species. For competitive fun, try the disc golf course located at mid-mountain. Rental gear for fishing and disc golf is available. If you want a bit more excitement, the resort has adrenaline pumping Zip Tour Adventures that combine runs on their two zip lines, one between Lookout Peak and Red Pine Lodge that's over 2100 feet! Nestled mid-mountain at 8,200 feet at Deer Valley Resort's Silver Lake Village, the Stein Eriksen Lodge is just minutes from Historic Main Street in Park City and 45 minutes from the Salt Lake City International Airport. One of the most accessible, year-round resort destinations in North America, the Forbes Five-Star, and AAA Five Diamond Stein Eriksen Lodge has long been recognized as a leader in providing world-class service and amenities. The impeccable attention to detail and undying passion for exceeding every expectation have made the Lodge a sanctuary to some of the world's most discerning travelers for 29 years. 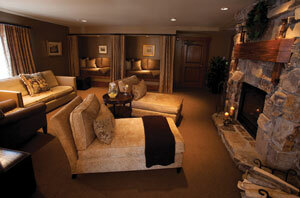 Like its namesake, the Olympian and world champion skier, the European-style Lodge exudes Norwegian elegance. Beamed cathedral ceilings and more than 145 stone fireplaces throughout the property provide a warm and inviting atmosphere. Each of the 68 suites and 112 guest rooms are unique in style, architecture and arrangement. All rooms are exquisitely appointed with distinctive elements and lavish amenities. Walking (or a short pedal) distance away from the Lodge are Deer Valley Resort's famed lift-served mountain bike trails accessed via the Sterling Express chairlift at mid-mountain and the Ruby Express chairlift at Empire Canyon. With over 60 miles of groomed singletrack, Deer Valley has been rated by Mountain Bike Action magazine as one of the ten best mountain bike destinations in the country. Bike rentals and lessons are available from all locations. After a long day in the saddle, a visit to the spa is a must. The Spa at Stein Eriksen Lodge is Utah's first to receive the Forbes Travel Guide's highest designation—the Forbes Five‐Star award— joining an elite group of 29 leading spas in the world. Spa guests receive a holistic approach to wellness and nurturing treatments from skilled therapists. Purposeful use of copper, water, stone and rich fabrics in the spa's interior, pay homage to Utah's Wasatch mountain range and Park City's rich mining history. A full line of locally crafted products feature indigenous cedar, sage, and salts to invigorate the mind and body. 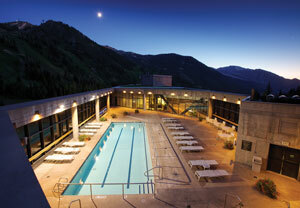 The Cliff Lodge & Spa is Snowbird Resort's flagship hotel. Situated in Little Cottonwood Canyon in the heart of the Wasatch Mountains, Snowbird is but 45 minutes from Salt Lake City International Airport. The Cliff is loaded with features and luxury amenities. Canyon and mountain view one and two bedroom suites are beautifully appointed. Located in the west wing of the Lodge, the Cliff Club condominiums are elegant. These 54 luxury condo units are elegantly decorated in simple Mission-style furnishings that define luxury while preserving commanding mountain views. The Lodge has three restaurants. The romantic Aerie Restaurant presents dramatic views of the Wasatch from its 10th floor location. Located in a spectacular setting on the 9th and 10th floors, The Cliff Spa has recently been remodeled, adding a Thai message program. The spa now has 21 rooms and over 30 treatment and salon services, yoga studio, full fitness center and a rooftop pool and hot tub. Although summertime in the canyon is way too short, Snowbird is a great destination for a warm weather getaway. When summer days heat up, temperatures in the canyon tend to be moderate. Snowbird's base and The Cliff are at 8000 feet and Hidden Peak at the top is over 11,000. The majesty of the Wasatch beckons visitors to hike through shaded forests or soak up the sun in an idyllic mountain meadow, lavishly colored with wildflowers. Snowbird has an extensive mountain bike trail system throughout Gad Valley and Peruvian Gulch that are a short pedal from the Lodge. Snowbird features a wide variety of summer events, activities and dining. In addition to lift served mountain biking, visitors can rent mountain scooters, a great option for less experienced riders. Hiking, wildflower tours, trout fishing ponds for the kids, and scenic tram rides will keep the whole family busy. Snowbird has bungee trampoline jumping, two separate climbing walls and a zip rider that whooshes harnessed riders a thousand feet down a suspended cable from a 50 foot tower near the top of the Chickadee lift to the Snowbird Center. Other activities are horseback riding, outdoor concerts, the annual Oktoberfest and more. Park City and nearby Deer Valley have several world class luxury properties. Sky Lodge is centrally located in the heart of this vibrant mountain town, replete with many outdoor adventures. The Hotel's smallest suites are like luxury Manhattan apartments. Except bigger! The Sky Lodge's bold, eclectic, exquisite suites offer expansive spaces with resplendent style that just may alter your idea of what a luxury hotel should be. There's nothing small here—from oversized private bedrooms, lavish baths, spacious great rooms and plentiful dining seating to the imagination behind the multitude of perfect touches and finishes throughout … the feel is of an over-sized loft space converted into a hip, chic uber-hotel suite in a downtown mountain town. Many consider Park City to be Utah's finest mountain biking destination. And road cycling doesn't take a back seat either with rolling terrain through nearby farmland. Fat tires, skinny tires, Burley tires, tricycle tires… all have a place in Park City. With close to 400 miles of trails, this mountain resort town has a little something for everyone in the tread-setting crowd. From an extensive system of moderate-to-downright grueling singletrack to training wheel-friendly, hard-surface pathways, the town's ever growing network of trails makes for plenty of non-motorized, two-wheeling fun. Backcountry trails weave through three ski resorts, open space and privately owned land. Relatively mellow loops like "Lost Prospector" and Round Valley's intertwining trails help novice bikers get their legs, while trails, such as "Spiro" and the 26-mile "Mid-Mountain Trail" cater to more experienced riders. Within the Park City area, hundreds of miles of purpose-built trails (i.e., not just old Jeep tracks) crisscross the mountain landscape. Sky Lodge is a perfect place to unwind after a long day in the saddle. Enjoy an après drink in the cozy atmosphere of Bar Boheme, or go for something with a little more swagger at Sky Blue. The Easy Street chefs amaze from the show kitchen and dazzle the palate with their artfully prepared fare. Red Mountain Resort near St. George in southwest Utah sits at the entrance of Snow Canyon State Park, home to 7,000 acres of red rock canyons and cliffs, lava caves and volcanic cones. Snow Canyon is one of Utah's premier rock climbing venues. Miles of paved bike trails wind in and around the Resort. Guided hiking and canyoneering are also offered, booked through Red Mountain Resort's Adventure Concierge. Zion National Park is a short drive from the resort. The park is internationally renowned for its hiking trails, like Angel's Landing, Observation Point, Emerald Pools and dozens more. The experienced guides are on hand to lead a personalized hike, climb, mountain bike ride, trail run, kayak, or archaeological adventure. 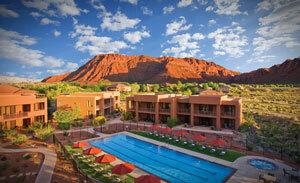 Choose a location near the resort, or a trip to Zion, Bryce, Gateway, Grand Canyon or Pine Valley Mountain. The resort features eighty-two beautifully designed rooms and twenty-four villa suites carefully situated on fifty-five acres of black lava gardens and fragrant mesquite. At Red Mountain's Sagestone Spa & Salon, you'll find a unique mélange of treatments, with a full spectrum of sensory pleasures, as stimulating and healing as the surrounding red rock cliffs and canyons. Many of these treatments can only be experienced at Sagestone. Inspired by ancient health and beauty rituals practiced throughout the world, the Spa custom-blends indigenous desert botanicals, Utah honey and mineral-rich muds, clays and salts to create tangible, restorative effects. The resort's whole body wellness program is extensive, featuring Bioelectrical Impedance Analysis (BIA), Iridology, Resting Energy Expenditure (REE) Analysis, Reiki and several other services. "Eat well, feel well" is the nutrition philosophy at Red Mountain Resort. At Canyon Breeze Restaurant, meals are included in Red Mountain packages and are satisfying and energizing, nutritious and delicious. A distinguished selection of fine wines and beers is on the dinner menu. From tofu ceviche to carrot peanut butter, the culinary team is constantly creating unique dishes that are both nutrient-rich and full of flavor. They also love sharing their expertise with guests through cooking demonstrations—a fun, informative experience with recipes and techniques you can take home and try in your own kitchen. 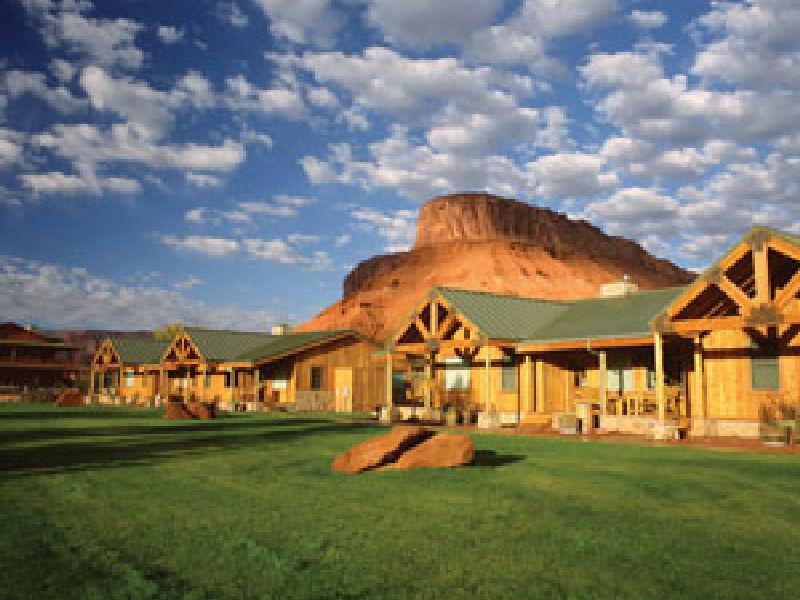 Just outside Capitol Reef National Park, intimate Cougar Ridge Lodge is a small, all-inclusive retreat with a wide selection of activities. Equestrian enthusiasts can enjoy the four beautiful stables and outdoor lighted riding area. Cougar Ridge offers guided World Class Fly fishing on the nearby Fremont River or angling for Brown trout in the crystal lakes of Boulder Mountain, the backdrop of the resort. Capitol Reef, just minutes away, is a hidden treasure filled with cliffs, canyons, domes, and bridges in the Waterpocket Fold, a geologic monocline (a wrinkle on the earth) extending almost 100 miles. A good way to see the park is through the Scenic Drive with its designated stops and pull-outs at interpretive points. One is the Moenkopi Formation, a massive, reddish brown rock over 225 million years old and 950 feet thick. But the superstar of the park is the Waterpocket fold. Intense crustal pressure reactivated a fault buried deep beneath the sedimentary rock layers of the Colorado Plateau. But to truly experience the park, pull on hiking boots and traverse some of the many trails that make Cap Reef a favorite of outdoorsmen. In the Fruita area, there are fifteen day hiking trails with trailheads located along the Scenic Drive. These trails offer the hiker a wide variety of options, from easy strolls along smooth, level paths to strenuous hikes involving steep climbs over uneven terrain near cliff edges. Moab means adventure. The venues for it are all here – Canyonlands and Arches national parks, the Colorado and the Green rivers and their confluence in Cataract Canyon, the Slickrock trail and dozens more mountain bike routes, Indian Creek and Wall Street for climbers. Fantastic backcountry terrain for Jeeping, hiking, canyoneering, horseback riding, hot air ballooning. 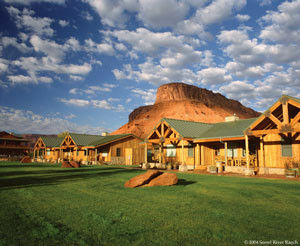 In the middle of it all, yet off the beaten path seventeen scenic miles from Moab, is Sorrel River Ranch Resort & Spa. Surrounded by dramatic rock formations, windswept landscapes, and clear, starlit desert skies and on the banks of the mighty Colorado River, Sorrel River Ranch stands as an oasis. Lush, landscaped acres, a full-service spa, friendly concierge services, breathtaking views and vistas, group and private horseback rides are the signatures of Sorrel River. This intimate ranch setting offers 55 comfortably luxurious suites. The River Grill Restaurant proudly presents farm-to-plate delicious dining with produce raised in an onsite garden. The headliner of the extensive wine list is the "Chef's Private Reserve" selection. Included are premium domestic vintners Silver Oak, Cakebread, Grgich Hills and Duckhorn and Argentina's Dońa Paula Malbec and Argiano Brunello di Montalcino, Tuscana. A number of exciting outdoor activities are accessible on-property. The private Equestrian Center offers rides for beginner, intermediate and advanced riders, including both group and private trail rides. Expert wranglers provide tours of the trails, vistas and views that made the Colorado River Valley a beautiful backdrop for some of Hollywood's longest lasting images. A sparkling pool, which overlooks the Colorado River, is a great place to unwind on a warm summer evening, and the property's hiking trails offer an opportunity to explore nearby. The area around the resort is an adventure-lover's dream come true. Set out rafting down river, sky dive over iconic red rock vistas, take an exciting off-road tour of the rugged terrain, experience intense rock-climbing or canyoneering or embark on a mountain biking or hiking excursion in one of the nearby national or state parks.